The Ladies’ Guild was originally organized to provide services to the church like cleaning, nursery class and children’s programmes. It has evolved into a series of important fellowship activities for those involved. The Guild meets on a monthly basis from August to May. Events are held in St. Mark’s Hall. The members plus other members of the congregation provide food for receptions after funerals, memorial services, confirmation services and other celebrations in our parish. Some Deanery events are catered to when representatives from other churches meet at St. Mark’s. Members have a bond with one another and help other members where they can. They have always enjoyed either pot-lucks or meals out at Christmastime and the end of the season. Through their fundraising, they distribute funds to support much-needed purchases at the church. Read the history of the St. Mark’s Ladies’ Guild. This group meets on the third Monday each month at 9:30 in the morning for coffee, muffins and fellowship. All men in the parish who are available to attend are welcome. Besides fellowship times, the Men’s Group also helps to maintain the church building, helps out with the setup for church activities and with special services. The group also meets for fun activities such as bowling, pool, golf and horseshoe pitching. 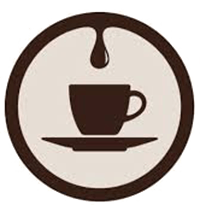 Currently, this group meets on the second Tuesday of the month at 7:00 p.m. Of course, no meeting is complete without enjoying coffee, tea and baked treats! There is a planned activity for each meeting which may include a speaker, workshop or discussion regarding a wide-array of topics. Typically, meetings end with a candle lighting ceremony and a prayer or reading. Many new friendships have been forged from this group. Members of this ministry team take turns hosting coffee time following each service. This is a time for worshippers to meet in an informal setting to enjoy coffee, baked treats and fellowship. Schedules are developed and the members commit themselves to the setup and cleanup about four times per year. Our annual Holly Jolly Faire includes homemade crafts and baking supplies provided by members of our congregation and the community. 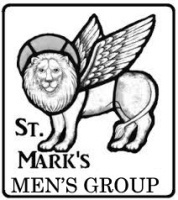 In addition to providing funds to support the St. Mark’s mission, food and funds are donated to the Brantford Food Bank. Volunteers are always needed to assist with the setup, manning of tables and cleanup. 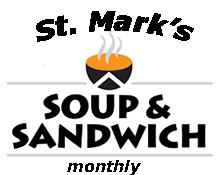 Homemade soups donated by parish members and sandwiches are available following the 10:30 service on a monthly basis from October to March. Over the six-month period, numerous volunteers work in the kitchen making sandwiches, doing dishes and cleaning up at the conclusion of the meal. Each volunteer is asked to either: provide a pot of soup or make sandwiches during the service. Because of the number of volunteers that so generously participate, it usually means that they only have to complete one of these tasks in any given year. Under the leadership of a group of our parishioners, volunteers sort through the mounds of ‘treasures’ donated by parish members, set up tables, price the merchandise and greet each shopper who passes through our doors. One person usually takes the lead. 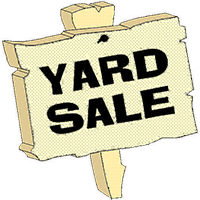 For the past few years it has been organized by the choir who help with the set up of the items donated for the yard sale, the pricing of these items and the selling. A volunteer list is posted for anyone in the congregation who can help. The Scouts are asked to assist in the moving outside of sale items, cooking/selling of hotdogs and cold drinks and the packing up of any items left at the end of the day. The Ladies’ Guild organizes the sale of baked goods and coffee/muffins. The Sunday School staff and children take care of the collection of gently used toys to raise money for the child they sponsor each year. One member (or a small group) takes on the responsibility of confirming advertising in local newspapers, posters to distribute in the neighbourhood, Sunday morning bulletin inserts, requests for float money, purchase of food/beverage supplies for the Scouts, signage for the day of the sale. As newcomers step into St. Mark’s on a Sunday morning, they need to be encouraged, nurtured, directed and welcomed into our community. 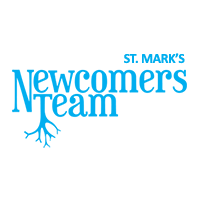 The Newcomers Ministry Team is a small group focussed on inviting newcomers to events, connecting them with others and communicating information about St. Mark’s via phone calls, visits and published material.